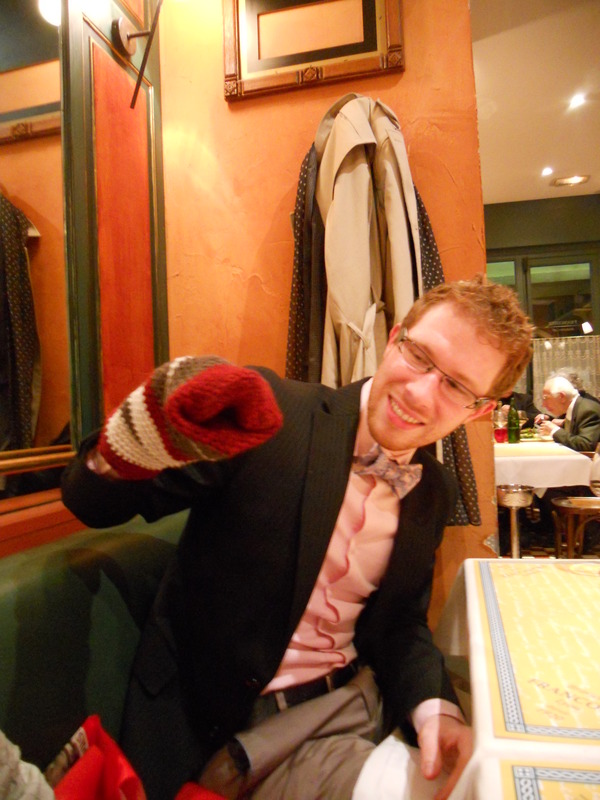 On my third to last day in France, I spent most of the day in class (more intellectual property lessons). After class, I wandered around and found a suitcase (it’s purple) and then met up with Cynthia for our last baking experience in France! 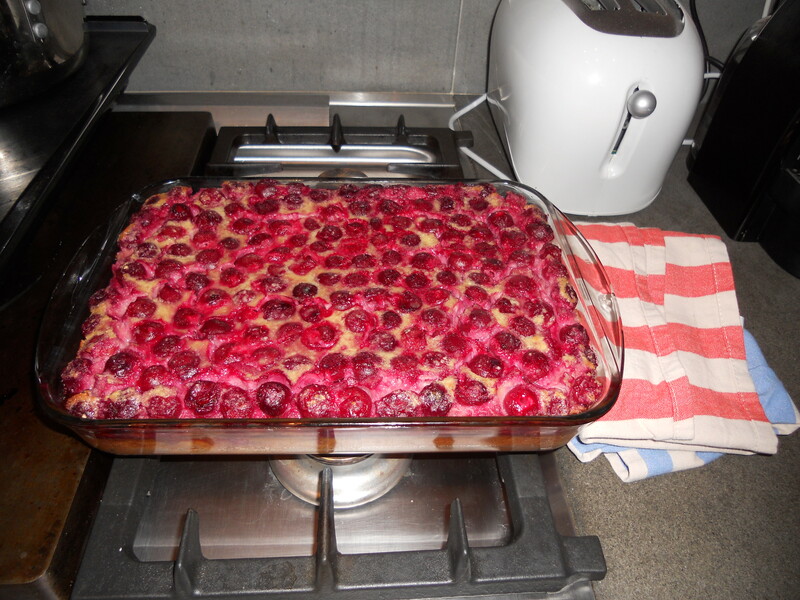 Since we had enjoyed making the mixed berry clafouti a few weeks ago, we thought we would make another clafouti. This time, we opted for a cherry one. The only cherries available in the frozen food store (Picard) were Les Griottes (Morello cherries), so we went with that. Sour cherry clafouti! Would be delicious served with vanilla yogurt. 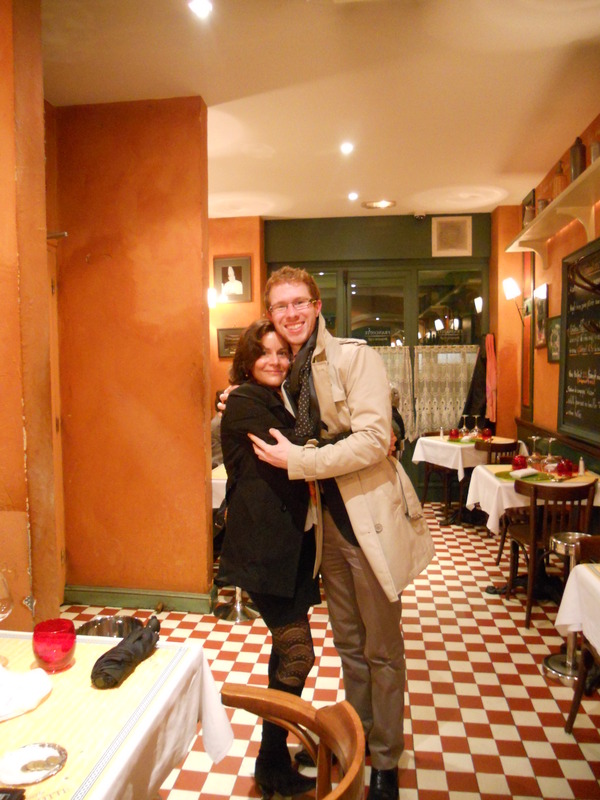 After our baking, we headed out for a traditional Lyonnaise dinner (we didn’t leave for dinner until almost 10pm, so we really went full-fledged French). 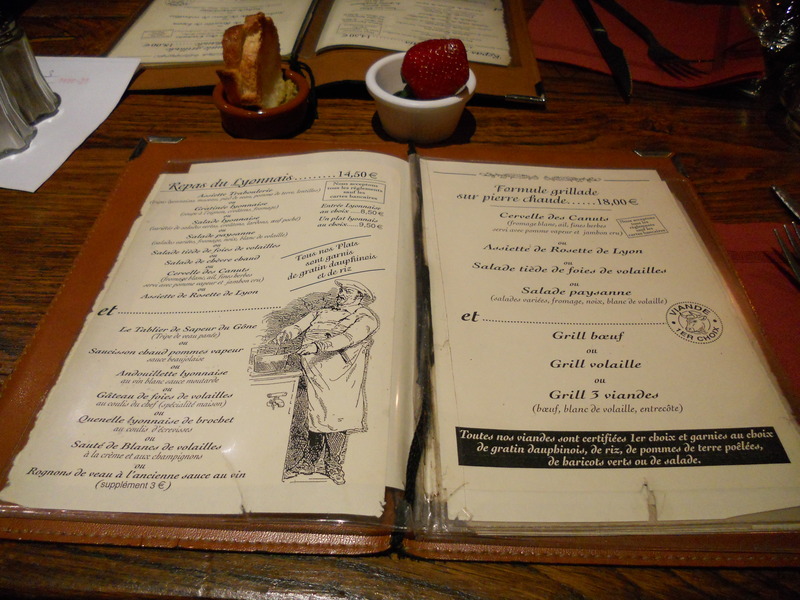 We decided to visit a bouchon Lyon, which is a traditional Lyonnaise eatery serving lots of sausages, duck paté and other Lyon specialties. 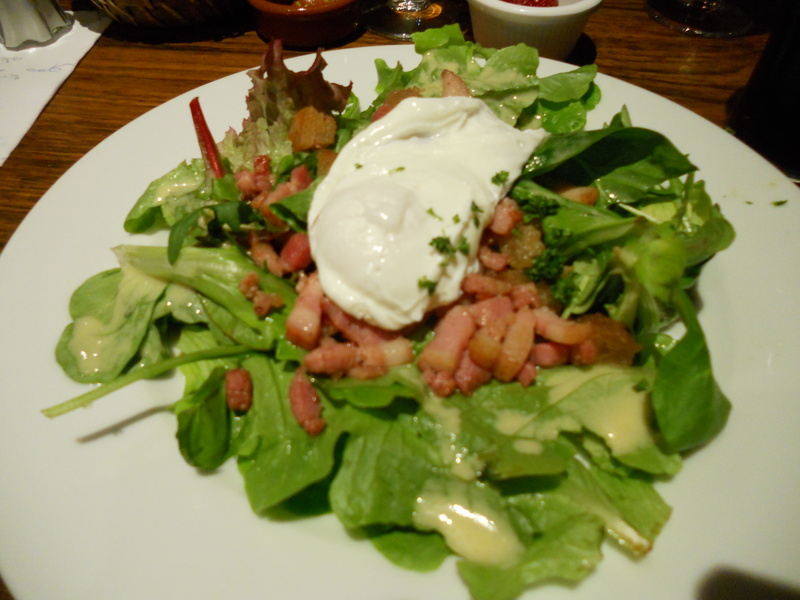 Since I hadn’t been to one yet (and really wanted a salade lyonnaise), we picked this one. 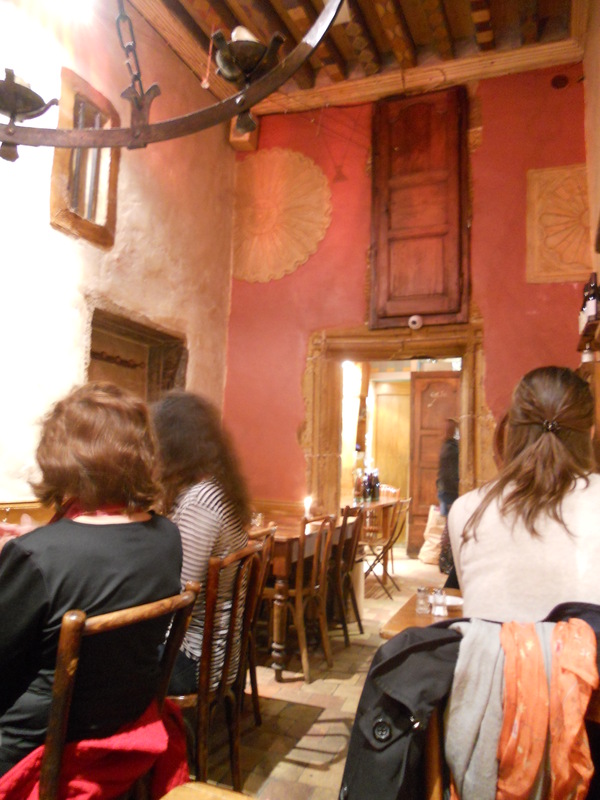 The interior was very homey and welcoming. 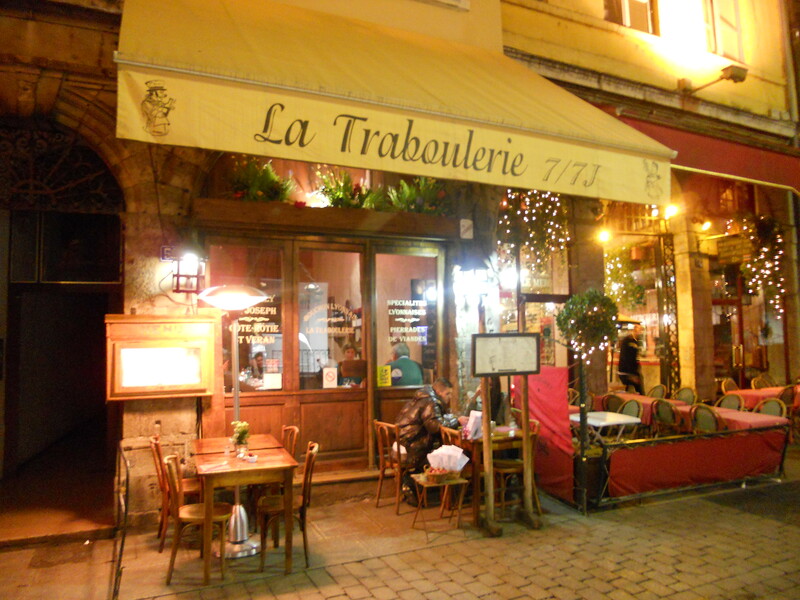 The restaurant was quite charming and the owners were super friendly. 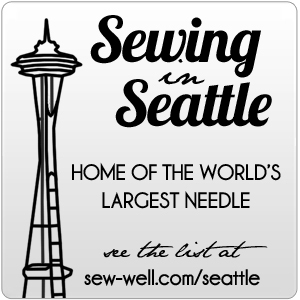 It seemed to be quite popular, too, so were felt like we must have made a good choice. 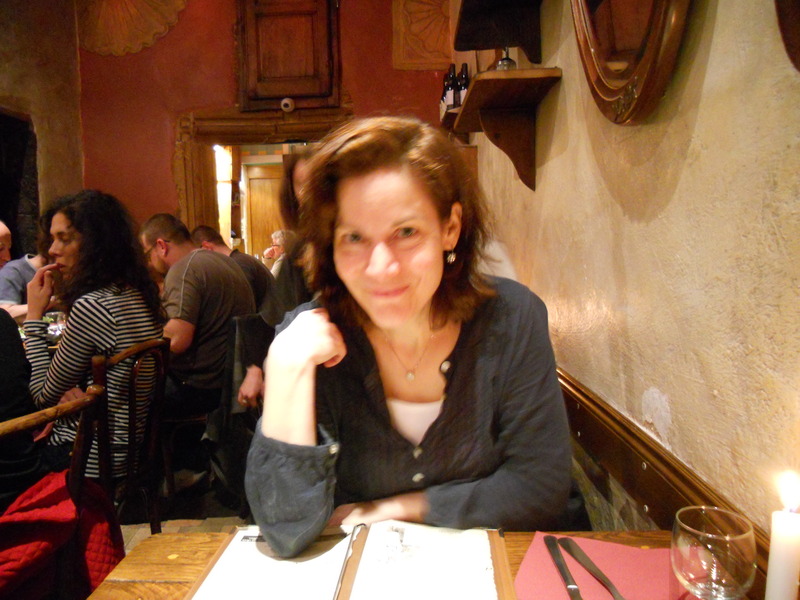 Cynthia was my willing companion on my quest for French food and offered a number of good suggestions on what I should try. Since I had been craving the salade lyonnaise, I opted for that for my first course (got to love the menu options, which include an appetizer and main dish for a set price). 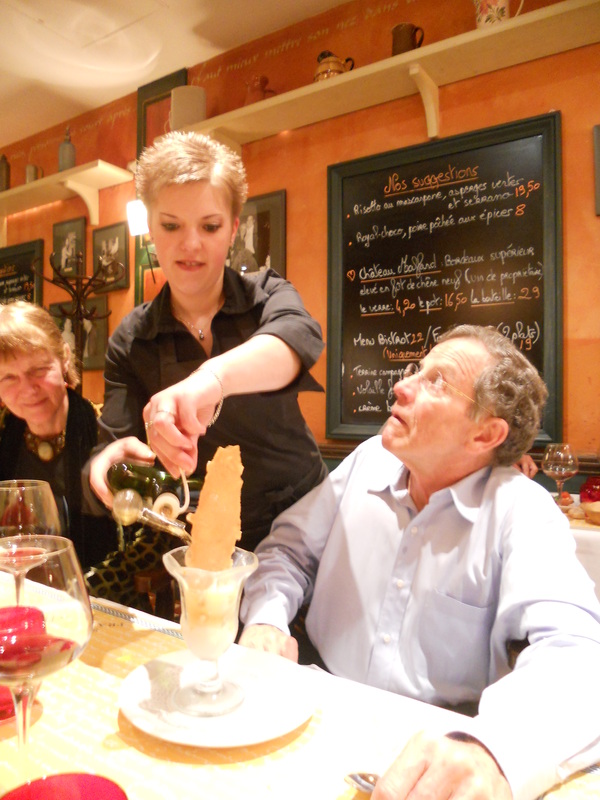 For my main dish, I decided to try something new that is a Lyon specialty – the quennelle lyonnaise de brochet. 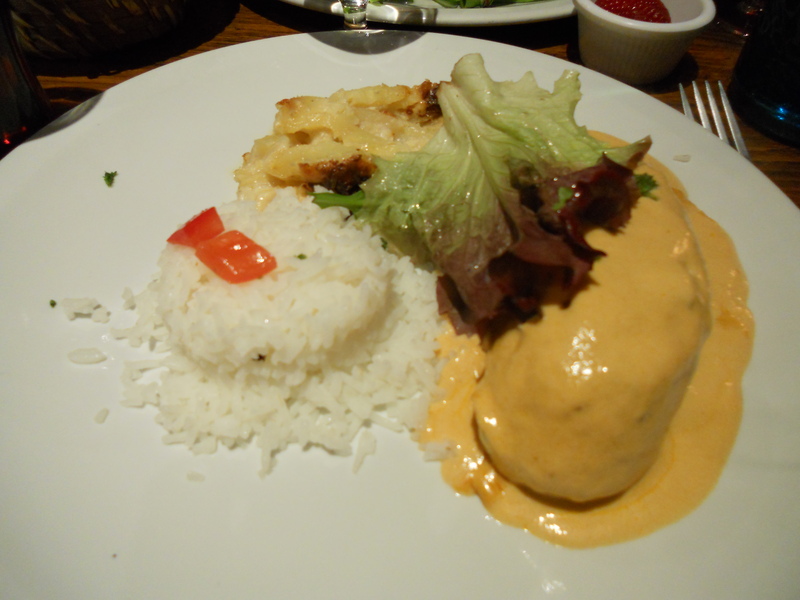 I don’t really know how to describe it, but it’s made with some sort of meal mixed with fish, baked and covered with shrimp sauce. It was very interesting and actually pretty tasty. The quennelle lyonnaise de brochet. And the potatoes served on the side were probably the best tasting potatoes I have ever had. Delicious! After dinner, we walked back to Cynthia’s apartment so we could end our meal with our homemade clafouti. 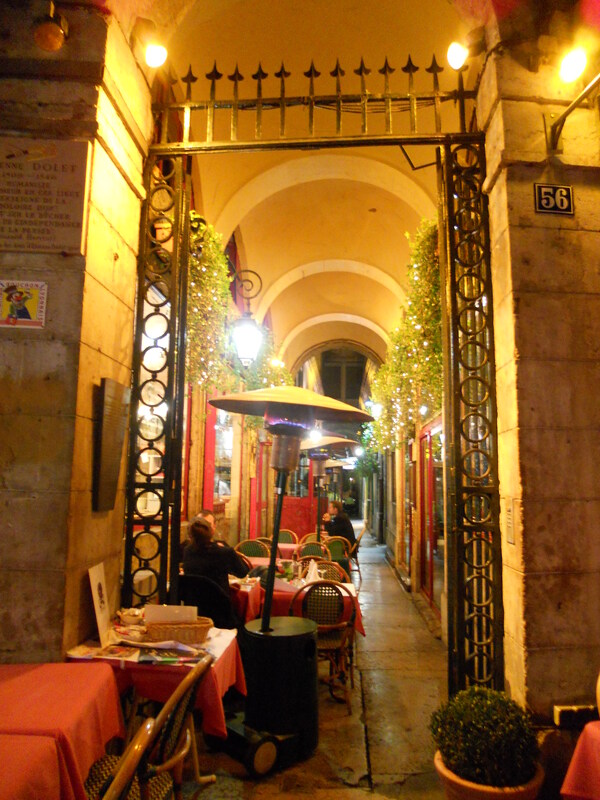 Very cute alley near the restaurant. It was a wonderful third to last day in France. 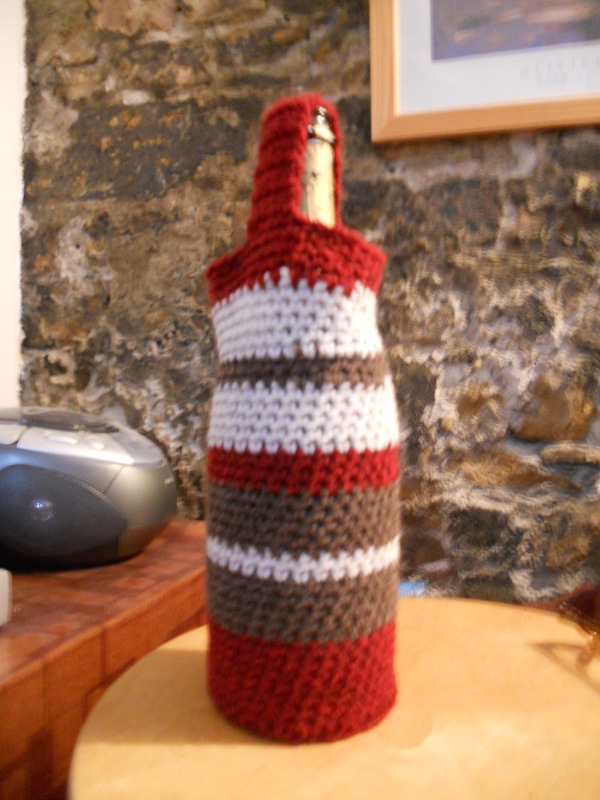 Between class and dinner, I decided to whip up a birthday gift for Cynthia, so I made her a wine cozy (without a pattern, of course). 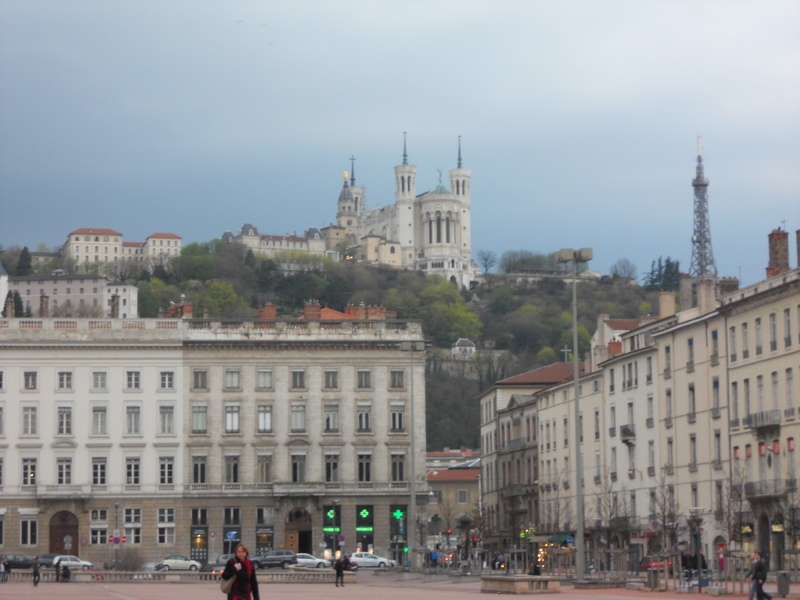 Then, I met up with Colton at place bellecour so we could walk to the restaurant that Cynthia’s parents (who are in town visiting) had picked out. Beautiful evening to celebrate a birthday. 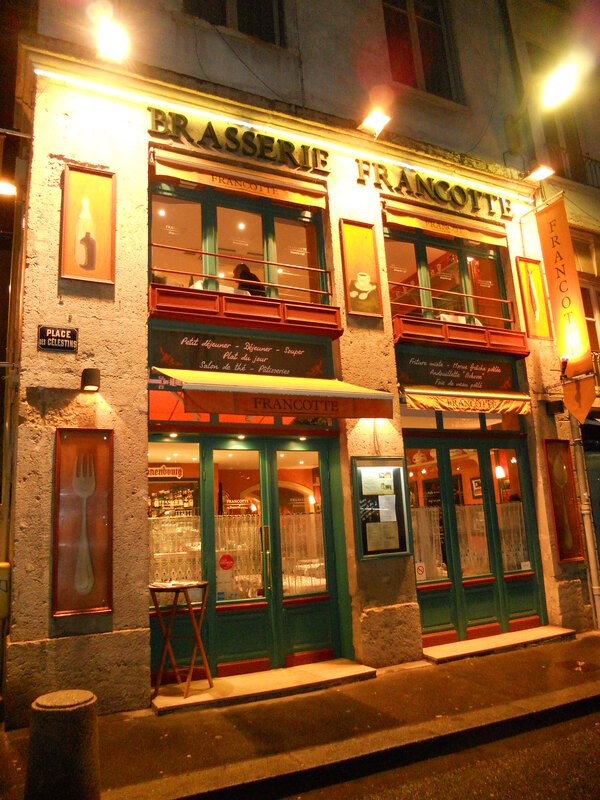 Cynthia’s mom had chosen Brasserie Francote, which was quite lovely! 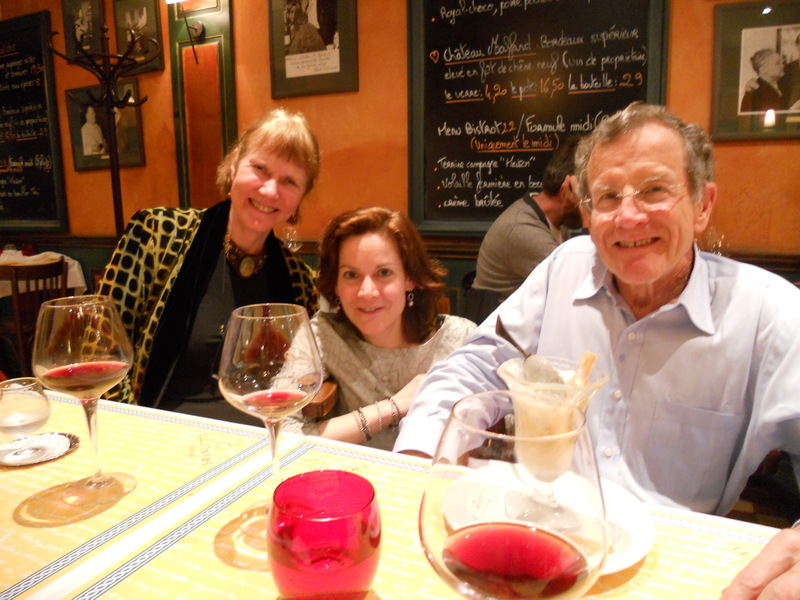 I enjoyed a wonderful dinner with Colton, Cynthia and Cynthia’s parents, who are adorable! 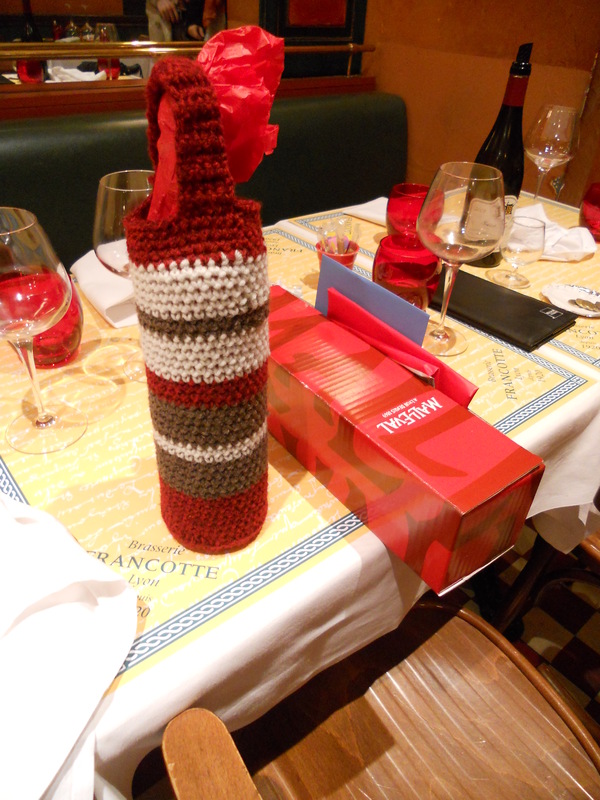 A wine cozy and two bottles of wine. Do we sense a theme here? Colton decided that the wine cozy made a better puppet, much like lamb chop. Colton... Shari Lewis... pretty much the same thing. For dinner, I had a fantastic piece of duck, served along side two fried quennelle natur (vegetarian quennelle). Yum! 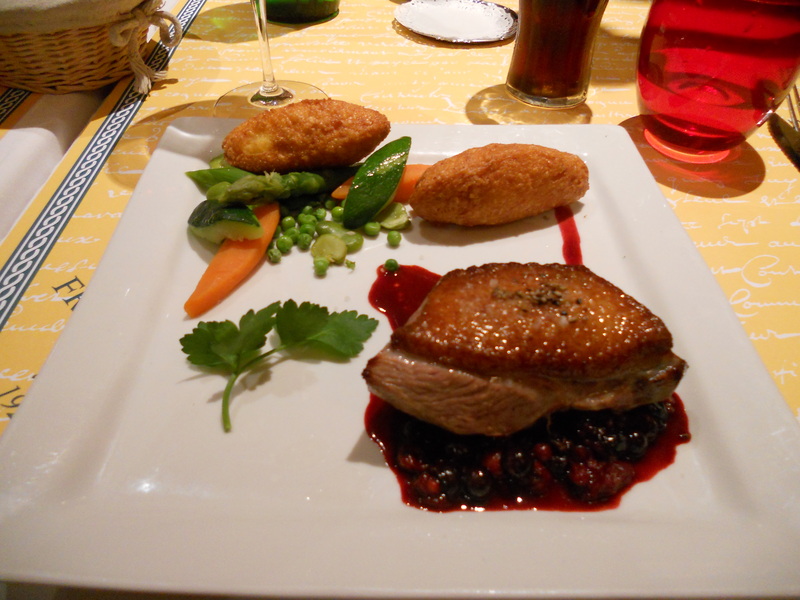 Duck with red berry sauce and quenneles. For dessert, I decided I had to try a professionally made clafouti to compare it to my homemade creations. 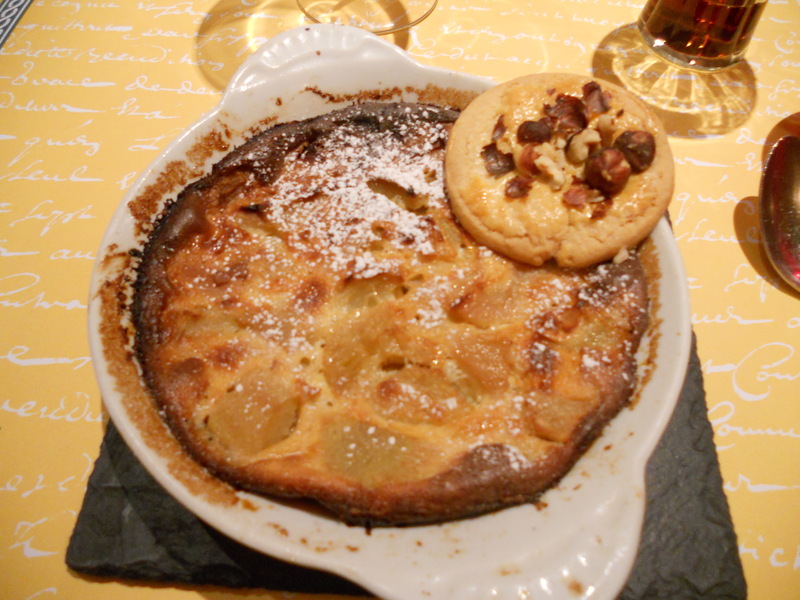 Clafouti with caramelized pear, grated walnuts and powdered sugar. It was quite tasty, but I prefer the homemade cherry one. In addition to delicious food and yummy wine, I also thoroughly enjoyed the company! Cynthia’s parents are wonderful and I’m so glad I got to meet them. Happy birthday, Cynthia! And thanks for dinner, Cynthia's parents! 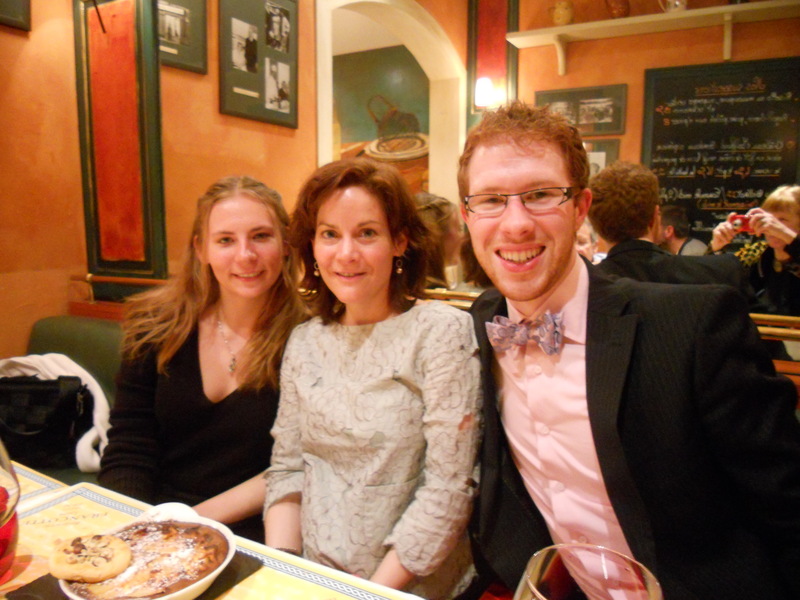 Sadly, this was my final meal in France with C²!! 😦 I’ve had such a wonderful time hanging out with them for the past three months that I will be quite sad to leave them tomorrow.